It’s an exciting time here at Jane Hoffman Group. We have launched our latest edition of Gallery Magazine and are thrilled with the result. Our extensive collection of Kelowna Real Estate Listings are professionally showcased in a beautiful coffee-table style magazine. We invite you to sign up to receive your own complimentary copy of Gallery Magazine. 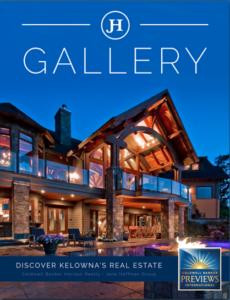 Peruse through our magazine and discover the best homes for sale in Kelowna. Enjoy the stunning homes, spectacular views, gourmet kitchens and expansive living spaces of our featured real estate listings. Gallery Magazine is another exceptional marketing avenue offered by Jane Hoffman Group. Our real estate listings sit proudly on display in an elegant magazine.